Ariel Kachuro/Assistant Photography Editor The Elsie B. Rosefsky Memorial Art Gallery opened last Thursday, Sept. 6, with visiting artist Jenny Day. Last Thursday, the Elsie B. Rosefsky Memorial Art Gallery in the Fine Arts Building welcomed visiting artist Jenny Day’s exhibition, “Lone Star, True But Whatever,” with a public, two-hour reception. Day’s exhibition, which will be shown in the gallery until Sept. 30, is inspired by her trip this past year to Port Aransas, Texas, a city that faced heavy damage from Hurricane Harvey. She said the series is meant to reflect the city’s resilience and patriotism while also exploring humor and irony as a response to current events. Her paintings feature remnants of a battered physical landscape, as well as elements drawn from dreams, memories or internet icons. Patches of gold leaf and glitter burst from her canvases, which are often framed with images of winding snakes or ribbons. On display for the first time are Day’s “cut ups” — collages of scraps and photographs that inform the images in her paintings and are sometimes directly translated into paintings. Day has never shown these before, but she decided to display them alongside her paintings for the first time at Binghamton University. “I thought that since this is an educational space, I could show part of my process,” she said. Since finishing graduate school at the University of Arizona four years ago, Day has shown her work mostly in group shows or commercial galleries. BU will be the first college campus she has shown at since she graduated, and this new setting has given her room to expand. As a result, the pieces in this exhibition are larger than any she has shown before. “Because I’m not selling from the school, I have a lot more room to be experimental with size and topic,” she said. Her decision to include larger pieces in this exhibition also stemmed from an experience she had while viewing another artist’s work during a visit to Marfa, Texas. “When I was walking through the exhibition, all I could think was, ‘I have to paint bigger,’” she said. Halfway through the reception, attendees gathered around Day while she spoke about the exhibition and answered questions. She discussed her undergraduate background in environmental science, emphasizing that her academic and career path has been full of surprises. Years after earning her first undergraduate degree, Day earned a bachelor’s in fine arts in painting at University of Alaska Fairbanks while working as a horticulturist. Day’s background in environmental science is reflected in her art, which draws inspiration from natural disasters and features themes of environmental destruction. 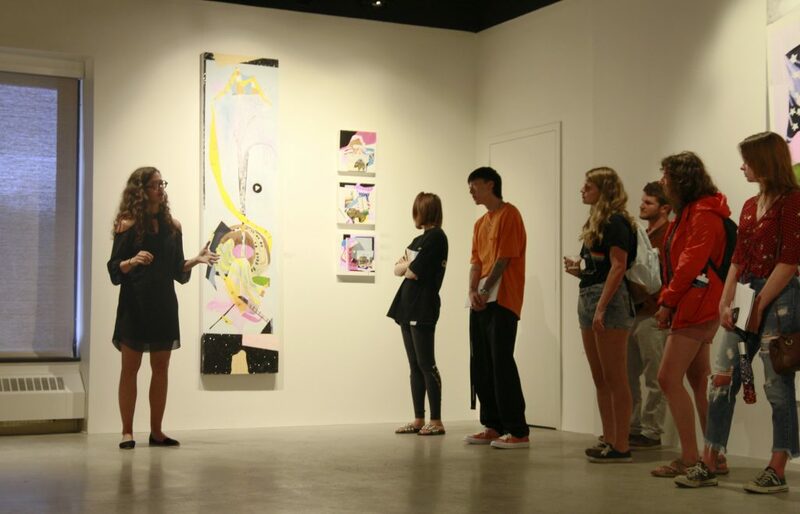 Megan Munley, a sophomore majoring in mechanical engineering, said that Day’s interdisciplinary approach to art reflects her own converging interests in nature, engineering and photography. Jackie Kachadourian, a senior double-majoring in art and design and theatre, said that she appreciated the culturally relevant subject matter of Day’s art. “It’s interesting to see social media and environmental studies in her painting, and it’s a different approach to painting than you normally see,” Kachadourian said. The exhibition will be shown in the Rosefsky Gallery until Sept. 30. The gallery is open to the public, free of charge.